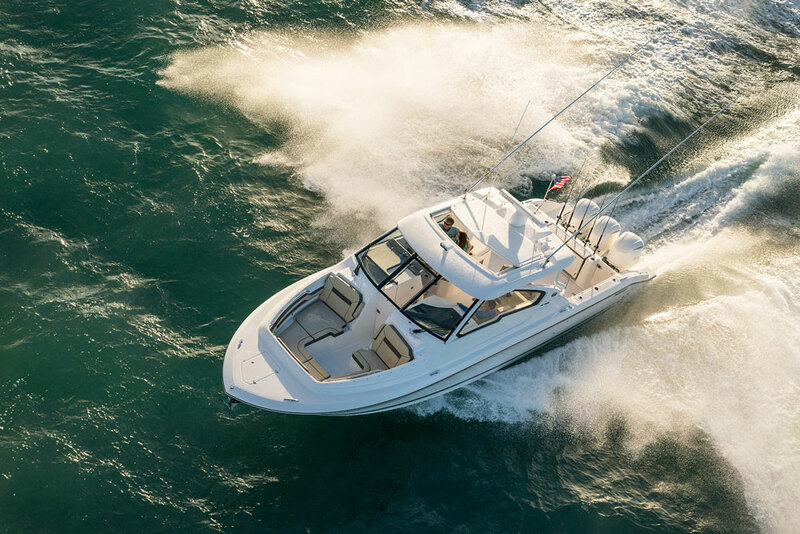 Dual console boats are not the first thing that comes to mind when boaters think of luxury, but on the new Pursuit DC 325, comfort is a standard feature. The world of dual console boats has changed radically in the past decade or so, and the new Pursuit DC 325 is a perfect example of how. We already knew that DC boats were flexible, and could be used for everything from fishing to watersports to day-cruising. But then they got big—really big—with 30’-plus models hitting the water from numerous manufacturers. Now along comes the DC 325, which not only takes advantage of the extra acreage, but also brings a few yacht-like touches into the mix. End result? 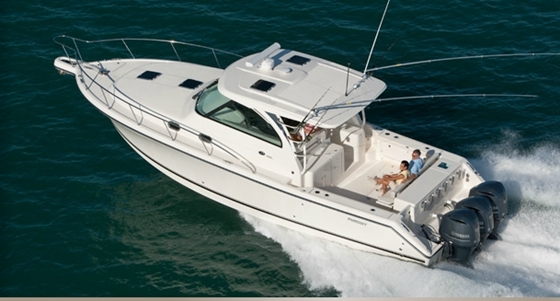 You get a day-boat that maintains that DC versatility, yet is a whole lot more than a day-boat. On the Pursuit DC 325, smiles abound. The first and most dramatic advantage you get in a DC like this is sheer deck space. Those 20-something dual consoles of yesteryear were maxed-out with four or five passengers onboard, but the DC 325 has seating for at least 10 people. And that’s comfortable seating, no squishing required. 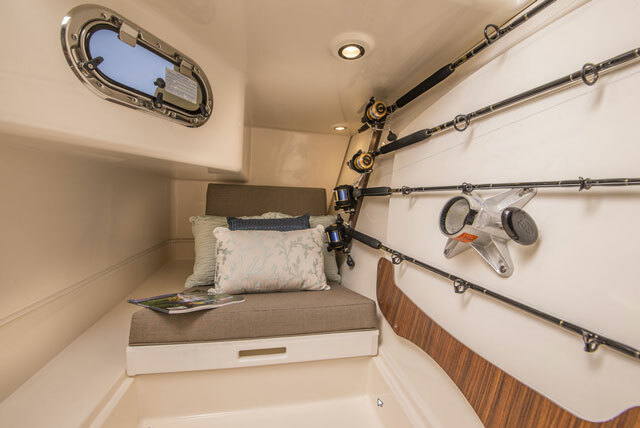 The transom bench seat has an adjustable backrest, and it folds out of the way to open up the cockpit for fishing trips. An aft-facing port cockpit seat is good for both cruising, and bait-watching while on the troll. The forward-facing passenger’s seat just in front of it combines with a wrap-around to create a lounge. And, as with most dual console designs, you get a bow cockpit with comfy seating (in this case along with fold-down arm-rests) as well. Another advantage of all this LOA: it allows Pursuit to enclose the helm deck under a hard top, with a full (fold open) windshield and large side windows. That means the 325 can also serve as an all-weather boat, which is quite a feat for a DC. Another way Pursuit brings more luxury into the versatility mix is how the cockpit and helm deck are outfitted. Along with the 24 gallon livewell, there’s also a wet-bar with hot/cold water, a sink, trash bin, and cutting board. Besides the cockpit tackle center, there’s also a 12-v stainless-steel refrigerator. And aside from getting stainless-steel gunwale-mounted rodholders, you also get an entertainment center with seven speakers, a sub-woofer, amplifier, and Bluetooth connectivity. Of course, lots of large DC’s that boast gobs of seating and multiple value-adding features are on the water today. What makes this one different can be seen in the details. All of those seats, for example, are filled with dri-fast foam and are backed with mesh so they can drain. The stowage compartments beneath them are insulated. And the hatches are both gasketed and guttered to drain overboard. On top of that, the detail work is flawless. When I climbed through the 325 I did my best to find a snafu in the finish to criticize, but it simply didn’t exist. Of course, no one boat is perfect in all ways. 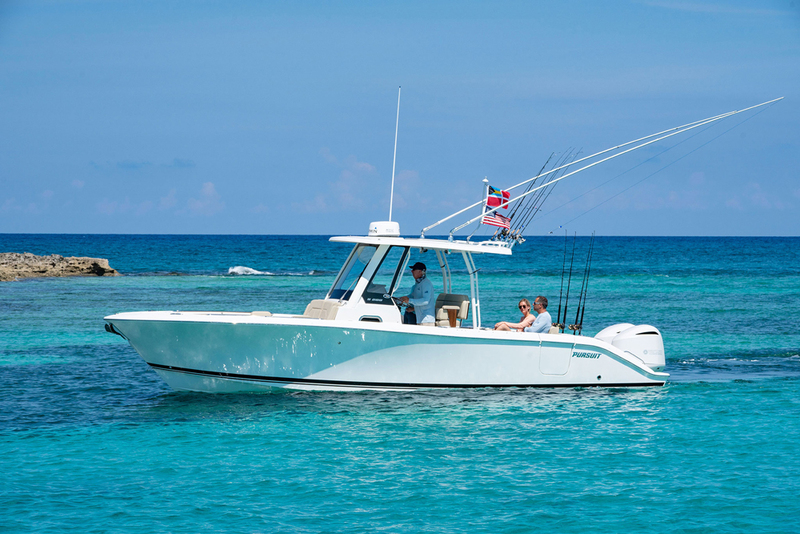 The one knock I’d make about the 325’s topsides can be said of virtually any dual console boat: if you’re a hard-core angler, between the hard top, pipework, and consoles, you can’t work a rod 360-degrees around the boat. And on the flip-side, if you’re a day-boater who doesn't care to use the livewell or tackle station, these items are a waste of space. Remember: the dual-console design is all about flexibility, not honing down to one specific mission. Another plus of owning a big DC is that these days, it means you get a cabin. Well, actually two cabins, in this case. The passenger’s side console houses a surprisingly large berth, plus a rod-rack for four rods. Again, note the attention to detail down here. Pursuit adds a cushioned strip on the end of the rack where the reels go, so they don’t bang and rattle against fiberglass when you’re charging through three-footers. That’s a rare and much-appreciated touch. The view from inside the passenger's console of the Pursuit DC 325. In the starboard-side console you’ll find a fully-enclosed head with a vacuum-flush commode, a sink, and a pull-out shower. There’s also a Corian countertop, hangers for wet gear, and a vanity mirror. If you want to make these cabins even more luxurious, add the optional 6,000 BTU air conditioning with reverse-cycle heat. And if you want to make the entire boat more luxurious, perhaps to the point of excess, get the 12,000 BTU system that sends cool breezes through the whole bridgedeck. Performance data courtesy of Pursuit. 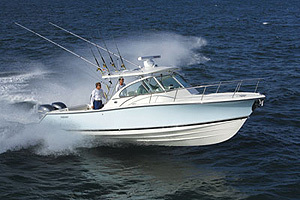 Power Twin Yamaha F300 four-stroke outboards, swinging 15.25" X 18" three-bladed stainless-steel props. 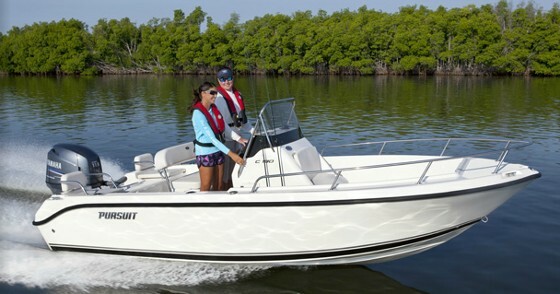 If you’re familiar with Pursuit boats, it won’t come as a shock that the DC 325 performs as good as it looks. 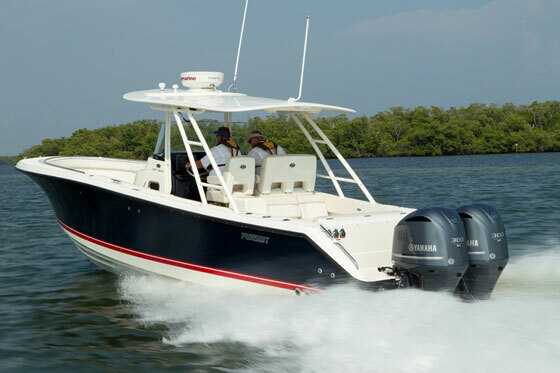 With a pair of Yamaha 4.2 liter V6 F300 outboards providing the power the boat cruises in the mid to upper 30’s, and with the throttles firewalled, hits a hat-stripping 51 MPH. Throughout the upper RPM range it gets between one and 1.4 miles to the gallon; that’s not eyebrow-raising efficiency, but is in line with the competition. 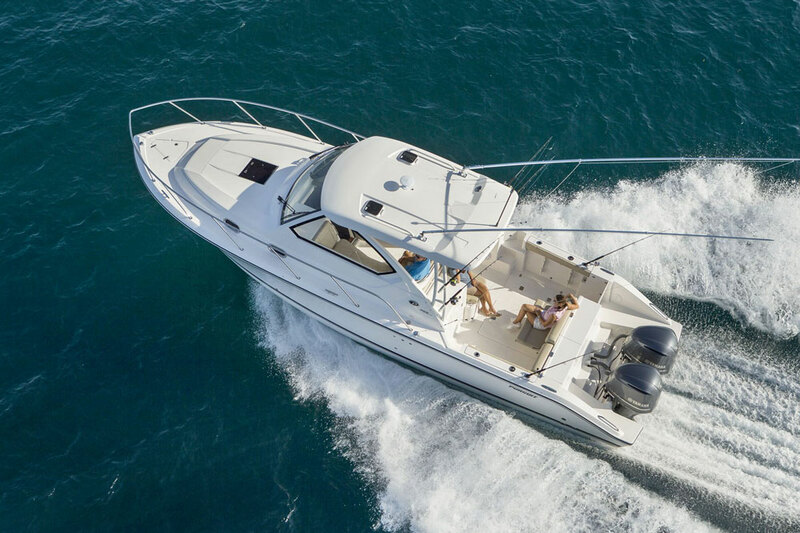 And note that with a whopping 300 gallons of fuel capacity, you have an effective range of over 300 miles at cruising speeds—that’ll more than do the trick whether you’d like to run to the canyons for tuna fishing, or run across the bay for lunch. Whatever purpose you’re putting the DC 325 to, the boat has one more feature that’s both unique and handy. We looked this boat over while judging the NMMA Innovations awards at the Miami boat show—and yes, it was a serious contender—and boarded from the stern. As each judge walked onto the transom, we first stepped onto swim platform wings that extend way back, beyond the outboards. They not only make aft boarding easier, but also allow better access under the outboard’s cowl while away from the dock. Smart money says this is a feature that other builders will come to mimic. You want luxury? You’ve got it. You want perfect detailing? Present and accounted for. You like fishing? No problem. You want a boat that has that extra something special? Then you need to check out the Pursuit DC 325. 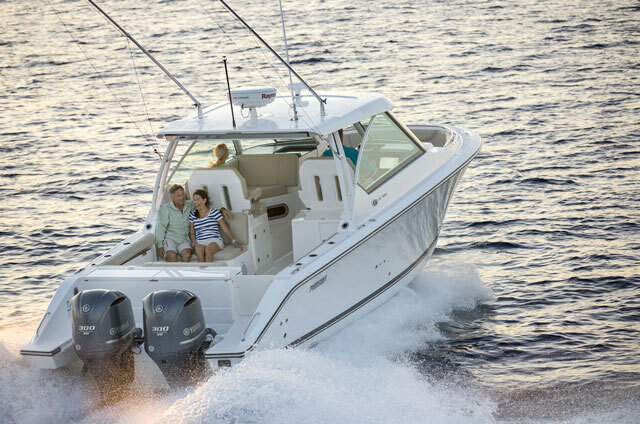 Other Choices: The Grady-White Freedom 335 is another big dual console that runs in similar waters. A smaller option would be the Edgewater 280CX. 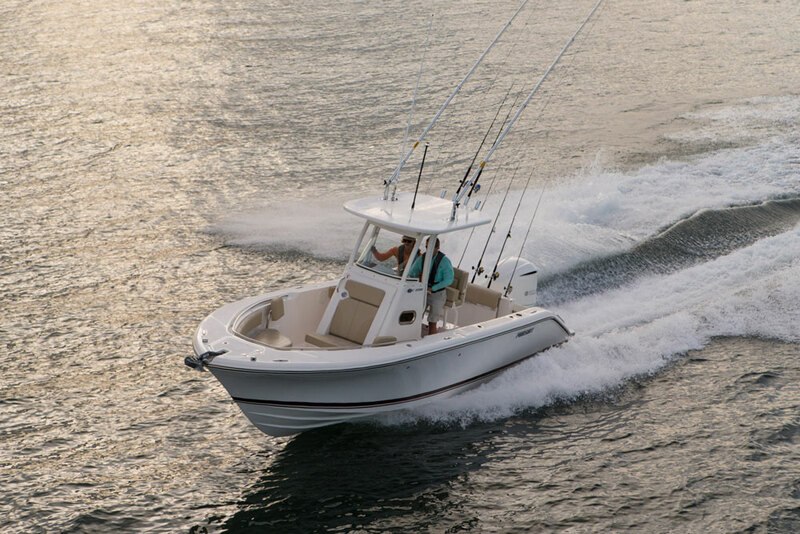 Shoppers gravitating more towards fishability will probably look at center console fishing boats, but if you couldn’t care less about fishing and want a DC that focuses solely on entertaining, check out the Sea Ray 350 SLX, Cruisers 328, or Cobalt 336. View Pursuit DC 325 listings.